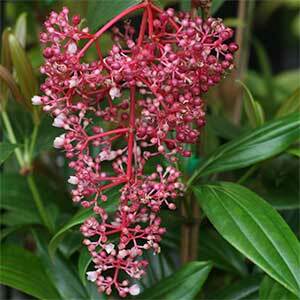 This is a tropical to sub tropical plant and Medinilla myriantha requires these warm humid conditions to thrive. From the Philippines and Malaysia it is commonly called the Malaysian Orchid. Grown for the foliage as well as the colourful flowers which hang down in large clusters, it can be grown as an indoor plant in cooler climates with a little extra care. This is an understory plant so it also needs a shaded position. It is also naturally epiphytic, so good drainage is essential. In true tropical areas it will grow outdoors beneath taller shrubs and trees. In cooler climates it is best grown in a container where humidity and moisture can be controlled. Fertilise with a general purpose slow release type fertiliser when grown in containers. Outdoors a top dressing of cow manure, blood and bone and compost once a year works well. Other Medinilla species include Medinilla magnifica and the unusual Medinilla gregori hambali. Common Names – Malaysian Orchid. Flowering time – In Tropical to sub tropical areas, right through the year.